There is increasing interest in location-aware systems and applications. It is important for any designer of such systems and applications to understand the nature of user and device mobility. Furthermore, an understanding of the effect of user mobility on access points (APs) is also important for designing, deploying, and managing wireless networks. Although various studies of wireless networks have provided insights into different network environments and user groups, it is often hard to apply these findings to other situations, or to derive useful abstract models. In this paper, we present a general methodology for extracting mobility information from wireless network traces, and for classifying mobile users and APs. We used the Fourier transform to convert time-dependent location information to the frequency domain, then chose the two strongest periods and used them as parameters to a classification system based on Bayesian theory. To classify mobile users, we computed diameter (the maximum distance between any two APs visited by a user during a fixed time period) and observed how this quantity changes or repeats over time. We found that user mobility had a strong period of one day, but there was also a large group of users that had either a much smaller or much bigger primary period. Both primary and secondary periods had important roles in determining classes of mobile users. Users with one day as their primary period and a smaller secondary period were most prevalent; we expect that they were mostly students taking regular classes. To classify APs, we counted the number of users visited each AP. The primary period did not play a critical role because it was equal to one day for most of the APs; the secondary period was the determining parameter. APs with one day as their primary period and one week as their secondary period were most prevalent. By plotting the classes of APs on our campus map, we discovered that this periodic behavior of APs seemed to be independent of their geographical locations, but may depend on the relative locations of nearby APs. 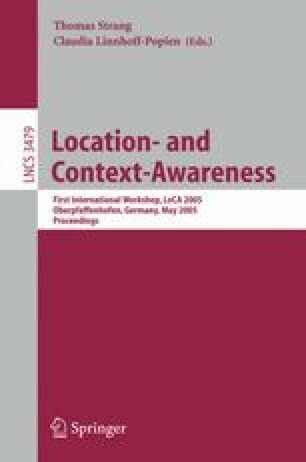 Ultimately, we hope that our study can help the design of location-aware services by providing a base for user mobility models that reflect the movements of real users.